I have been thinking about writing this article on Hybrid Cloud for quite some time, but with everything going on at VMware, article writing time is becoming limited. Recently VMware announced the new Hybrid vCloud service and I wanted to take a look at the whole “Hybrid cloud model” and what I think (without my VMware hat on) it should actually be/do/mean. Lets start by looking at what the definition of Hybrid Cloud is. This article from searchcloudcomputing certainly sums up VMware’s and most peoples view. A hybrid cloud is a composition of at least one private cloud and at least one public cloud. A hybrid cloud is typically offered in one of two ways: a vendor has a private cloud and forms a partnership with a public cloud provider, or a public cloud provider forms a partnership with a vendor that provides private cloud platforms. In some situations, the customer may need both a local server running specific applications and a cloud service that hosts additional applications, files, or databases. In such a situation, the two are often configured for interoperability. 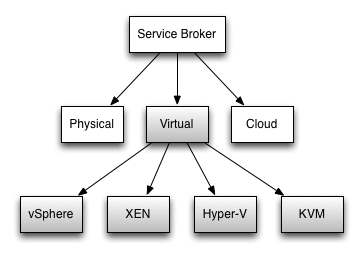 Now this is all great, but to me its not the full picture of how a Hybrid cloud should be. To fully understand what Hybrid Cloud is we need to look at cars (my other favourite subject). Think about the Toyota Prius (which I detest by the way), this is a true hybrid car. It has a battery and a petrol powered engine to drive the wheels. It can be propelled purely by using the battery, petrol engine or it can use both together for better performance. Now we need to look at how we can take this model and move it into IT. This is how and where I see the benefits of Hybrid Cloud. We need a mechanism that sits above all the different technologies that can manage and deploy to these entities. 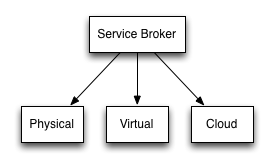 A service broker is a nice term that I have heard in the past. The diagram above shows how this would work. In my mind a consumer comes along, requests the deployment of the workload, and it is deployed on the best platform or technology suited to that workload. This can be in physical form (not that I would encourage that too often lol), virtual or direct to the cloud. This to me is where true Hybrid comes into play. 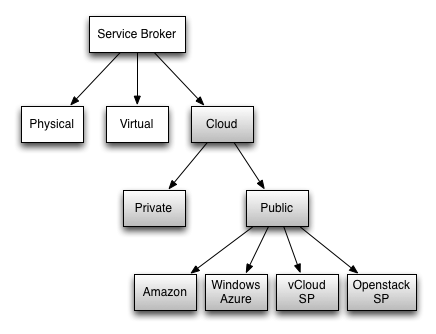 Imagine as we just mentioned, a consumer comes along and requests there deployment of a workload, and the options available to the service broker are multiple hypervizors, as well as physical. The service broker can deploy the workload to the best suited Hypervizor available to it. We can even break this out further to the full cloud model, where we dont even care about the Cloud provider or type of cloud they run. Imagine the potential now, the consumer comes along, requests the workload, and the service broker can deploy to any environment whether it is Physical, Virtual, or to any type of public or private cloud available. This to me is the true definition of hybrid cloud. Now the reality of designing and implementing such a model is a completely different story, but for the consumer (who really doesn’t care), this would be the ultimate way to consume IT as a Service for them.